Posted September 17, 2012 7:02 am & filed under Travel. 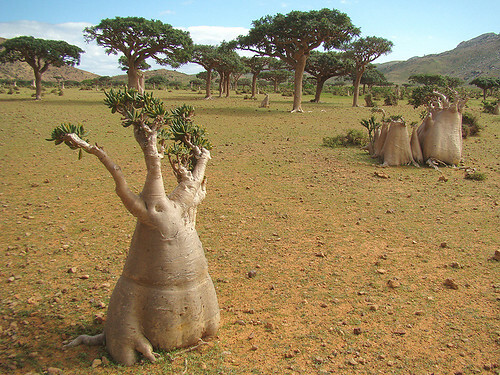 An impressive specimen of an Adenium socotranum, or Adenium obesum ssp.socotranum, in Yemen. A desert rose anchors itself on the Maalah cliffs, in the company of more than 300 other rare plant species on Socotra. In the distance lies Qulansiyah, one of the island’s largest towns. Not just an impressive specimen, but also an impressive photographic feat. And a little bird! Check out some other pictures of these giants here and here.